Hotel Julien Dubuque is an elegant boutique hotel that blends historic charm with modern amenities in the heart of the Old Main District. Built in 1839, the stately hotel was lovingly restored to its former glory with inspiration drawn from the renaissance of downtown Dubuque and reflects the elegance and grandeur of the surrounded historical district. A true landmark of luxury and sophistication, the Hotel Julien Dubuque features refined guest rooms and suites with private bathrooms, self-service bars, mini-fridges, and coffeemakers, while luxury suites have spacious sitting areas with pull-out sofas, whirlpool tubs, and fully equipped kitchens. Other upscale amenities at the hotel include a sophisticated restaurant and lounge, an indoor swimming pool and whirlpool tub, an exclusive spa and wellness center, a fully equipped fitness center, and complimentary wireless Internet. 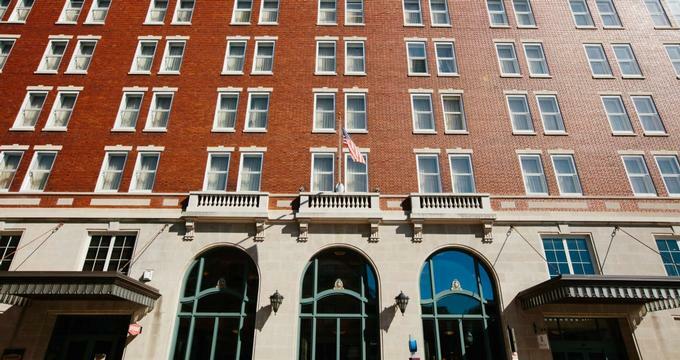 Ideally located for a quiet getaway from the city or for exploring the historic town of Dubuque, Hotel Julien Dubuque is a short walk from the National Mississippi River Museum and Aquarium and a few miles from Crystal Lake Cave. Hotel Julien Dubuque offers 133 beautifully appointed and stylishly decorated guest suites, ranging from Executive and Deluxe Rooms to Luxury and Whirlpool Suites and an elaborately themed suite that celebrates the life of Al Capone. All accommodations feature king or queen-size beds with pillow-top mattresses and luxury linens, and en-suite bathroom with walk-in showers, plush towels and bathrobes, and spa-quality bath products. Sitting areas have large work desks with ergonomic chairs, iPod docking stations, and honor bars, and other in-room conveniences include LCD flat-panel HDTVs with cable channels, alarm clocks, fridges, coffee makers, irons and ironing boards, and complimentary wireless Internet. Executive Rooms feature one king or two queen-size beds with pillow-top mattresses and luxury linens, and en-suite bathroom with walk-in showers, plush towels and bathrobes, and spa-quality bath products, and sitting areas with comfortable armchairs and ottomans. Deluxe Rooms offer extra levels of comfort and space with king-size beds fitted with pillow-top mattresses and luxury linens, and en-suite bathroom with walk-in showers, plush towels and bathrobes, and spa-quality bath products. Sitting areas boast rich wood furnishings, sleeper sofas for extra guests and large work desks with ergonomic chairs, and modern amenities include LCD flat-panel HDTVs with cable channels, alarm clocks, fridges, coffee makers, irons and ironing boards, and complimentary wireless Internet. Luxury Suites are well-appointed two-room suites with two queen-size beds dressed with pillow-top mattresses and luxury linens, and en-suite bathroom with walk-in showers, two-person whirlpool baths, plush towels and bathrobes, and spa-quality bath products. Separate living rooms have two large LCD Flat Panel HDTVs, sleeper sofas, and comfortable armchairs, and large work desks with ergonomic chairs and in-room conveniences include LCD flat-panel HDTVs with cable channels, alarm clocks, fridges, coffee makers, irons and ironing boards, and complimentary wireless Internet. Whirlpool Suites are perfect for romantic weekend getaways or business travelers who want extra space and comfort and feature king-size beds fitted with pillow-top mattresses and luxury linens, and en-suite bathroom with walk-in showers, plush towels and bathrobes, and spa-quality bath products. Sitting areas boast rich wood furnishings, sleeper sofas for extra guests and large work desks with ergonomic chairs, and modern amenities include LCD flat-panel HDTVs with cable channels, alarm clocks, fridges, coffee makers, irons and ironing boards, and complimentary wireless Internet. Whirlpool Suites can be combined with Luxury Suites to create two-bedroom Whirlpool Suites with sleeping areas are connected by communal living areas with sleeper sofas for additional overnight guests. Premier Suites offer the ultimate in comfort with fully equipped kitchens, open-plan living rooms, private bedrooms with king-size beds fitted with pillow-top mattresses and luxury linens, and en-suite bathroom with walk-in showers, plush towels and bathrobes, and spa-quality bath products. Kitchens feature granite countertops, breakfast bars, full-size appliances including a dishwasher, and cabinetry stocked with cookware, dinnerware, silverware, and glassware. Well-appointed living areas have relaxing reading chairs, sleeper sofas and 42” LCD Flat Panel HDTVs with cable channels. Named after the notorious Midwestern gangster of the Prohibition Era, the opulent Capone Suite is private, spacious, and luxurious. Decorated in a vintage theme rich with Old World Hollywood glamor, the suite features a fully equipped kitchen with granite countertops, a breakfast bar, full-size appliances including a dishwasher, and cabinetry stocked with cookware, dinnerware, silverware, and glassware. A spacious living room and meeting area is accessed by French doors and has an executive dining table for eight guests, and a sleeper sofa, two comfortable chairs and a 42” LCD Flat Panel HDTV with cable channels. The suite has two large king bedrooms and en-suite bathrooms offering granite-topped vanities walk-in showers, plush towels and bathrobes, and spa-quality bath products, and a half bathroom is situated off the living area. Vast windows around the suite embrace breathtaking views of the Mississippi River, and modern amenities in the suite include LCD Flat Panel HDTVs with cable channels, alarm clock radios with iPod docking stations, hair dryers, irons and ironing boards, and complimentary wireless Internet. Caroline’s Restaurant serves delectable American cuisine in an inviting and relaxing atmosphere. Open for breakfast, lunch, and dinner; Caroline’s presents creative menus of delicious American cuisine with a twist, along with signature cocktails, fine wines and craft beers from around the world. The Riverboat Lounge is an elegant lounge where light appetizers and handcrafted cocktails, spirits, craft beers, and fine wines can be enjoyed in a laid-back ambiance. The Lounge serves an enticing small plate menu, a variety of craft cocktails and excellent wines, and offers live entertainment four nights of the week, making it the perfect place for after-work drinks, pre-dinner cocktails, or a stylish night out with friends. An outdoor terrace boasts comfortable seating and breathtaking views of the Mississippi River. The Hotel Julien Dubuque offers luxurious accommodations and an array of deluxe amenities and facilities for guests to enjoy. Upscale services include an indoor swimming pool and whirlpool tub, a fully equipped fitness center, an exclusive spa, and wellness center, and 15,000 square feet of meeting and banquet space for up to 400 people. Caroline’s Restaurant serves breakfast, lunch, and dinner daily and the elegant Riverboat Lounge provides a relaxing spot for appetizers, drinks, and live entertainment. A business center has copying, faxing and printing services, along with complimentary wireless Internet, and the hotel provides free parking for guests. Guest services include room service, same-day laundry service, a grocery shopping service for long-term guests, and a complimentary shuttle service the to the airport and various other attractions. The Hotel Julien Dubuque has beautifully appointed spaces for special occasions and celebrations from intimate weddings and ceremonies to grand receptions of up to 400 people. Venues include the elegant Grande Ballroom with its 17 foot chandeliered ceilings, the Fleur de Lis with its grand windows overlooking historic Main Street, the River Room, and the Harbor Gallery.